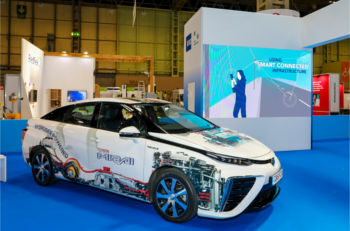 The main theme for Traffex 2019 was: How is technology driving change on the network? How is this technology making change happen in your opinion? Alistair Gollop, technology services engineering lead, Mott MacDonald: Across the media, we have all seen many articles and items about how autonomous vehicles will change our daily lives. However, although we aren’t all being chauffeured by our car yet, this is undoubtedly the biggest catalyst for change to the network in the last sixty years, since the introduction of the first motorway in the UK. Manufacturers are currently busy developing vehicles with the aim that they will have the ability to operate independently; however the real key to facilitating their adoption and optimising both the efficiency and safety of these vehicles, will be the establishment of communications facilities with roadside infrastructure. This key element of infrastructure will allow vehicles to see beyond the horizon (or corner!) and allow it to make informed decisions that not only improve their efficiency but also their safety. Much has been said about how autonomous vehicles will make much of the current roadside infrastructure redundant, however, although the plethora of equipment visible to users may become redundant, it is probable that the requirements for sensors and communications facilities will maintain the requirement for ITS infrastructure in the long-term. Simon Ellison, technology capability director, Costain: In terms of mobility what we lack today is a system that brings together the convenience and positive experience of car travel with the space efficiency of mass transit. Today, 85% of commuter car journeys are in single occupancy vehicles, an estimated 30% of traffic in towns and cities is made up of people driving round looking for somewhere to park, and people tend to want to travel to the same places at the same time causing gridlock whilst at other times and in other places, the roads are quiet. We also lack a proportional and visible relationship between the amount of time and space we occupy on the road network and the amount we pay. The good news is that this relationship is now achievable using intelligent data and technology-based solutions. Furthermore, not only is it achievable, but it has to be the answer. Why have you chosen Traffex to take people on this Future Mobility journey? Alistair Gollop: As the premier event for the industry in the UK, Traffex is the only occasion with the ability to take 10,000 visitors through our vision for future mobility. The exhibit will take visitors from a yesteryear without technology, through the current day, and on toward the future, where we look at the pathway to autonomous vehicles and how mobility will span modes and place to provide a cohesive means to get about. In addition to the Future Mobility feature, Traffex offers us the opportunity to also have a dedicated Future Mobility Theatre, where speakers will discuss a wide range of issues which will face us in the coming years. We will also have the Collaboration Café where you can discuss how developments in mobility will affect us all, over a coffee. We are delighted to co-curate the Future Mobility feature at Traffex 2019, because it encompasses the essence of what we do at Mott MacDonald – we open opportunities with connected thinking. Simon Ellison: Traffex is the UK’s largest and most established event for all those involved in the highways sector. As leaders in the future mobility space, Costain is delighted to be bringing the exciting new ‘Future Mobility’ central feature to Traffex 2019 in collaboration with Mott MacDonald: over a 350m2 area visitors will be taken on a journey through past, present and future concepts of transport. Alistair Gollop: By using a journey narrative, we will be showing those who may not be directly involved with emerging transport features, existing and emerging technologies, and our wide-ranging list of speakers in the Future Mobility Theatre will offer discussions on the future implications of tomorrow’s transport, including the technological, legal, social and economic impacts. This will provide visitors the opportunity to gather a much better understanding of how to prepare for the future and what to expect over the coming years. Simon Ellison: We want to promote the need for citizen-centric development - when we think of delivering capacity improvements, relieving congestion, improving safety and air quality on our urban and suburban roads, the answer isn’t going to come from building new roads; it’s going to come from technology and smart use of data to understand what citizens want and help to change behaviours. To create truly connected places it’s vital that we integrate our infrastructure and network systems and fully integrate the range of diverse mobility solutions. Cross-sector collaboration will be essential to achieve this, so we are looking to engage with a wide range of clients, partners and suppliers at Traffex this year to drive innovation. What does future mobility mean for the industry and the road user now and in the future? Alistair Gollop: Over the course of the next few years, we will increasingly start to see developments across a broad range of modes to tackle the issues we face today, mainly centred around congestion and the resulting problems this causes, like pollution. Modal shift to sustainable transport modes has been highly successful in some areas, and the move to zero emission vehicles will provide a major improvement to the quality of life in our urban areas. However, we need to concentrate on more than just introducing autonomous vehicles, otherwise we run the very serious risk of actually ending up with far greater levels of congestion. We therefore need to ensure that a comprehensive transport offering is maintained, so that the benefits of mass transit can be enjoyed by all, not just the privileged. Simon Ellison: There will be a shift in the infrastructure we need and how we use existing infrastructure. The industry will shift to provide new services, and towards integrating new technology to increase capacity and improve customer service and resilience without the requirement to build, particularly as there are limited new roads or railway lines to be built. Road users will have more of a say in the infrastructure that is developed, will have more choice through Mobility as a Service (MaaS), decarbonised vehicles and new dynamic public transport. What are the main challenges and opportunities relating to future mobility being implemented and delivered on the network and transport systems? Alistair Gollop: One of the principal issues facing the implementation of an effective and cohesive mobility system is the fragmented nature of the way in which the various modes are currently owned and operated. Reaching agreements between multiple stakeholders is exceedingly difficult, because of the conflicting commercial agendas and imperatives facing many operators. To assist this, the benefits of actively engaging with initiatives needs to be demonstrated to organisations, so that they can clearly see how they will increasingly be left behind by those that start to benefit from new facilities. Simon Ellison: The challenges are varied: scalability of solutions, keeping up with the pace of change, being able to deliver projects quickly, working across multiple sectors and understanding the impacts of change on other sectors and industries, true collaboration and the integration of multiple diverse parties. However, the opportunities outweigh the challenges and today are greater than ever. It’s exciting that we have the ability to make better use of our existing networks, to enhance mobility, increase inclusion and service accessibility and to ultimately, create better places for people through mobility solutions. What can we learn from abroad in terms of future mobility? Alistair Gollop: There are many pilot schemes being undertaken across the globe that are attracting interest and feeding discussions. One of our roles as an international consultant is to review and make sense of pilot findings for clients across a number of regions. A common theme is how adoption of new transport solutions depends on many human factors, and that some solutions may create more congestion issues in the short term before longer-term benefits are realised. Simon Ellison: We can learn a lot, particularly from our neighbours in Europe. Norway has been very successful in providing electric vehicle (EV) charging infrastructure for their people and promoting the use of EVs across the country which has resulting in Europe’s highest EV penetration. Amsterdam has more people commuting via cycling, walking and public transport than by private car due to the enhanced active transport infrastructure. Barcelona has plans to free up nearly 60% of streets used by cars through turning them into “citizen spaces” by creating superblocks around mini-neighbourhoods. This should reduce traffic by 21%. If I gave you £1m to kick-start a new research project related to future mobility where would you invest that money? Alistair Gollop: Although there are many issues to be faced on our journey to future mobility, including the issues which face rural mobility and empowering vulnerable users to make best use of developments; a key issue that will need to be looked at in detail is the interface that will be required between the mobility sector and smart city stakeholders. The use of a UTMC type common database may provide a viable option for gathering disparate data streams together and providing a cohesive means to interface between all transport modes and other aspects of daily life, required to effectively manage our busy cities. I would take this investment to develop this capability and look to roll out a trial to demonstrate its effectiveness. Simon Ellison: If I were a local authority I would probably invest it in Multi-Modal Hub planning to drive local economic growth, and smart technologies to reduce congestion, ease traffic flow on the network and increase pedestrianisation.